Europa Super Premium Adult Nutrition provides your dog with a nutritionally balanced food specifically formulated for active, healthy dogs. The high quality lamb meat meal is ideal for dogs with a sensitivity to beef, chicken or fish. Lamb Meat – contains high levels of lamb and rice for optimum palatability and small, firm stools. Single Protein Source – assists those dogs with a sensitive digestive tract. Sustained Energy Release – with the addition of oats to our formula, we are able to give your dog a sustained release of energy throughout the day. 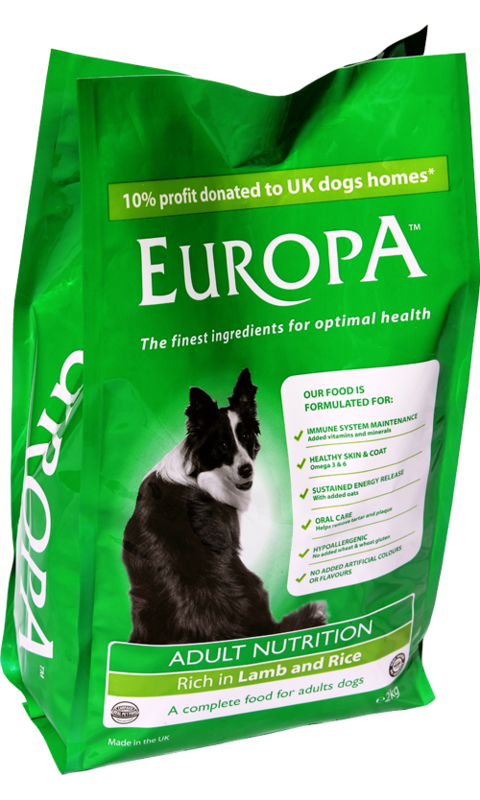 Immune System Maintenance – Europa Super Premium Adult and Rice contains specific vitamins and minerals to help maintain your dog’s immune system. No added artificial colours and flavours.